I must be in a Blue Jewelry mood lately, I took a look around my little Esty shop http://www.etsy.com/people/Alyssabeths this morning and noticed that there is sure a lot of blue going on! 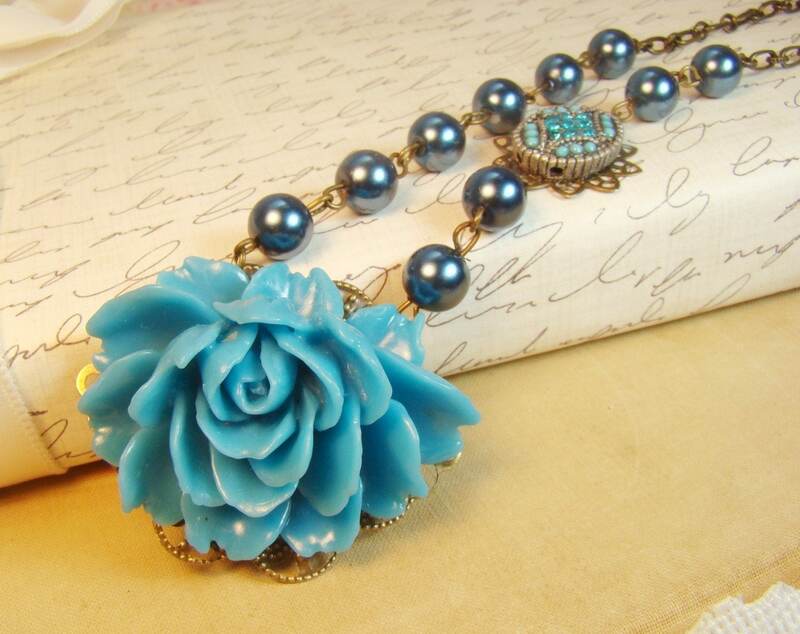 Romantic Roses and Pearls in Teal Necklace - Handcrafted romantic large blue rose flower, teal pearls & vintage turquoise & rhinestone cabochon necklace. Created using a large teal blue bourbon rose set on a lacey filigree, teal glass pearls and a Victorian styled ornate oval turquoise and rhinestone brass cabochon on an antique brass filigree setting, all set onto a lovely oxidized brass chain This, as with almost all of my jewelry is a one of a kind piece, and will not be massed produced. 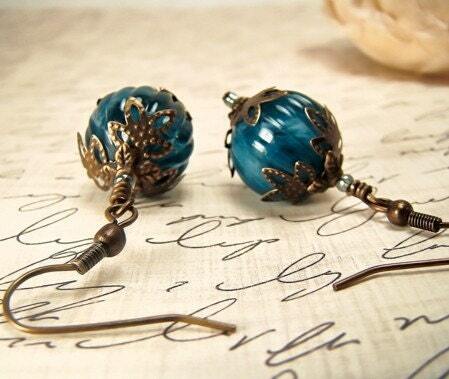 Vintage Navy Blue Swirl Bead Earrings - eautiful vintage inspired earrings, featuring vintage navy blue and white marbled fluted or ribbed Lucite beads, vintage and new oxidized brass leafy bead caps along with little blue gray glass seed beads. 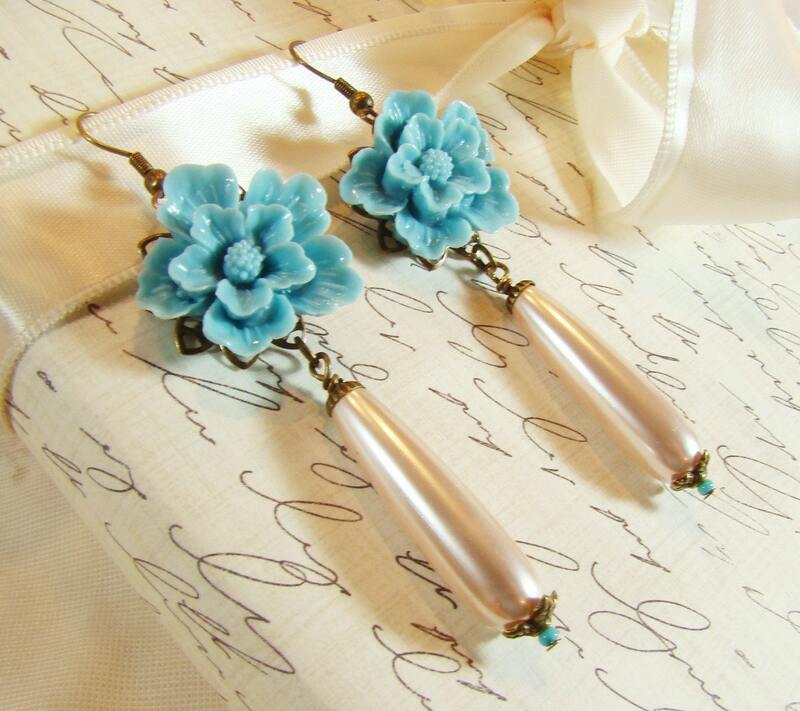 Each earring measures 1 5/8” in length, vintage blue beads measure 14mm. 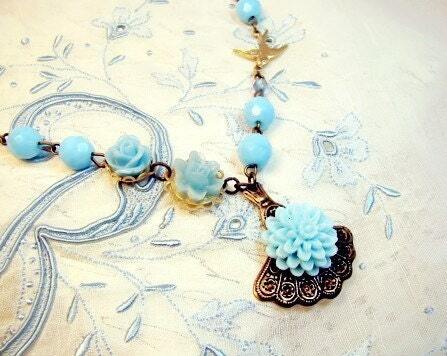 Necklace Flowers in Blue Antique Style - Handcrafted necklace created in shades of pastel blue, vintage antique brass filigree fan charm set with a dahlia cabochon, rose and lotus cabochons, vintage faceted Lucite beads, tiny faceted crystal beads, and then a lovely brass robin or sparrow connector. All attached to an oxidized brass chain.